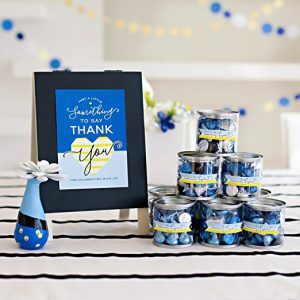 Favors are something you have to plan to give for your guests. A token of your appreciation, a thank you. 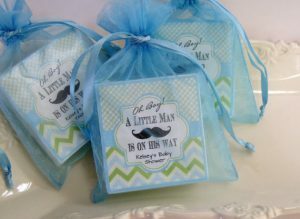 I agree, baby shower favors for boys can be intimidating. Some of you think it can be hard to find or make. That is why I provided many examples that you take or modify to suit your party theme and colors. Favors are often bought around the theme of the celebration. For little boys, they can be moustache, little prince, woodland, train/cars… In my posts on individual themes I always provide an example of a favor. 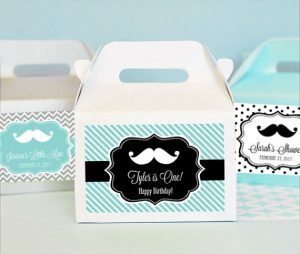 First one is a beautiful gift box, you can add anything you want such as chocolates, candies, or a tiny gift. Or the chocolate wrappers shown above. This is a very economical. If you are on a budget you can buy the Hershey candy bars in bulk or M&Ms and wrap them with these beautifully made wrappers. Other themes are also available. These containers are great for treats. You can add a little tag with a cute note and tie them in the little hole provided. Or tie a ribbon and hang them on the branch centerpiece, guests can then grab them when they leave. Favor soaps made of goat’s milk is perfect little token for all the ladies. Little Prince theme is also one of my fav. 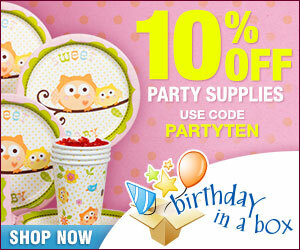 You can get cute gifts such as – soaps and tea light candles. 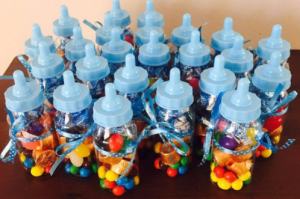 Here is a list of all baby shower favors for boys at an affordable price. 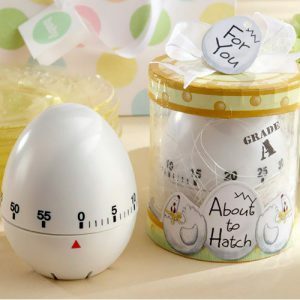 This egg timer is pretty much neutral and it’s always a big hit at parties! 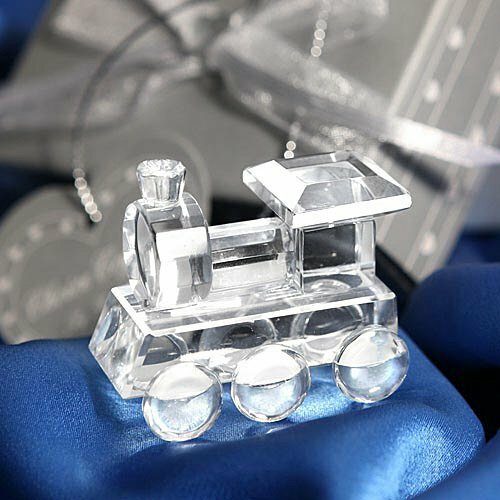 I love crystal favors. They make them look expensive and you will never be ashamed to give this gift to your guests. What an impact these will make! There are also pacifiers and baby bottle key chains. Cigars made of bubble gum. These can be given alone or added to another small gift. 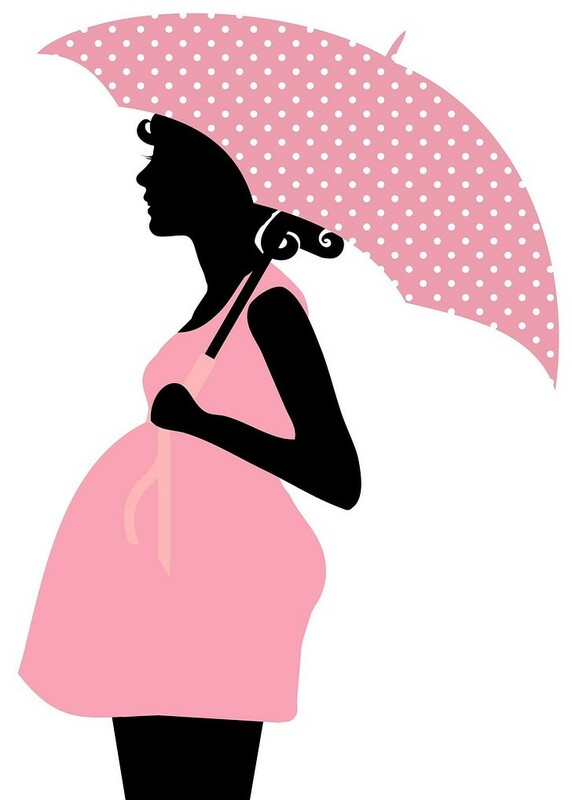 Add a tag with mommy’s name and a thank you note and voila! 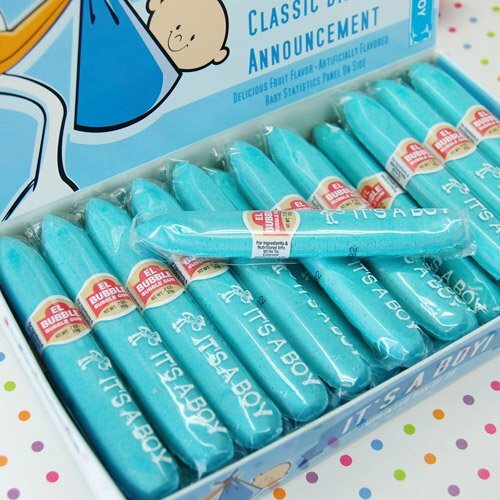 Or get these cigars in chocolate – love the box! 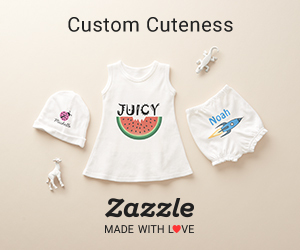 Ok, how cute are these! Fortune cookies with a special message. Add these to each guest plates. No need to go crazy on expensive favors. Plus you can get them in any color to match your theme! 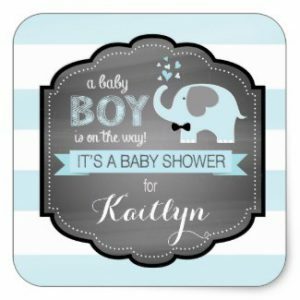 More custom baby shower favors here. Baby Blocks made of Oreos! Edible favors are very nice to give also. These ones are wrapped in white choolate and have each a letter or footprints. 4. Baby Bottles as favors. Fill them up with candies, m&m or skittles! Anything goes. Thank you Sticker or add with ribbon a tag. To make it a bit more pretty, you can attach these mini pacifiers. 5. It’s a Boy blue pens are another great little present you can hand out or add on to your favor. These can be used when guests arrive to sign the guest book or to play games. 6. Place these mints or blue hershey in tin cans, glass jars, plastic containers. Sticker or tag them. 7. Candles are often given so why not decorate it with a lovely label with this beautiful saying. You can get plain candles or scented ones. Adorable! 8. Stickers are a great touch to any bag or box. Here is an example of one for boys. They are 1 1/2″ or 3″in diameter. 9. Fill up a bowl of these delicious chocolates on each guest table or a large bowl at the candy bar. 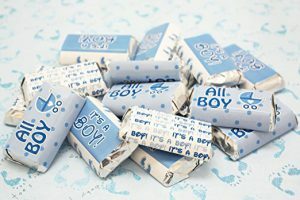 It’s a Boy Stickers for Hershey’s Miniatures Candy Bars in bulk. These one come in set of 54. 10. 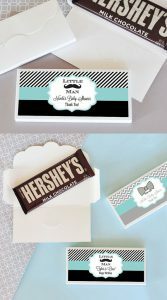 If you will DIY your favors, you will probably need not only stickers but a nice ribbon. Some have tiny little foot prints, some have little dots. Which ever one you use it will add a nice touch. Also these ribbons can be used to decorate other items such as diaper cakes. 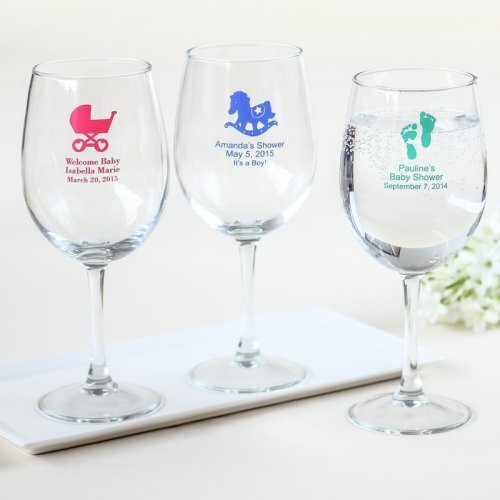 If you are looking for that unique favor for a boy – how about these personalized glasses with a name of mom and date of shower. Everyone needs a wine glass. This is perfect for toasting the new parents. Have these placed on each guest table. Do it yourself favors are also a great idea. It is a lot of work but if you have few friends helping out it can be an option. 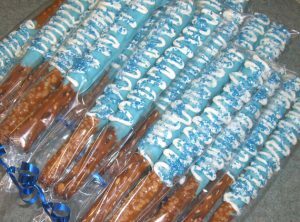 You can make dipped pretzels such as these. Another idea are these hair ties. Very affordable, they come in a pack of 3. These would be simple to make if you can find elastic bands and print your own cardboard card. 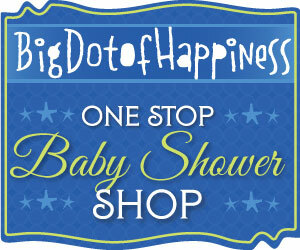 Look no further for affordable custom baby shower favors or here. These little tokens as small and sweet, just enough to say thank you for coming. 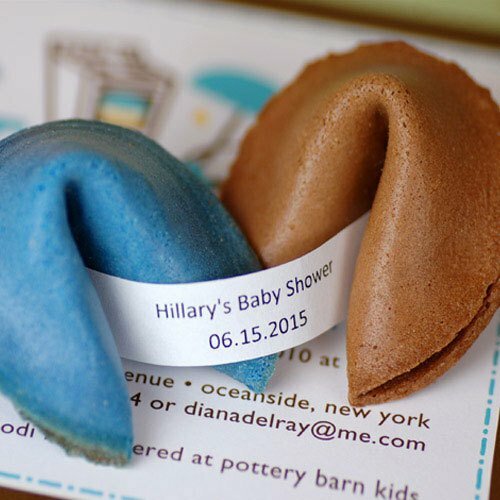 Here are some more unique baby shower favor ideas you can look at and see if you can also use.